You might be in a hurry, you might not see the sign, or you might see the sign and not care. There are a lot of reasons to make a u-turn in today’s world, and being in a hurry is a huge factor. Just because there is no sign restricting a u-turn at a certain intersection, does not mean it is safe to do so. You must be able to perform the u-turn in a safe manor without interfering with oncoming traffic. An example of interfering with other traffic would be if the size of your vehicle is too large or the width of the road is too small to execute the 180-degree turn. Trying to complete a u-turn in one of these scenarios would cause you to perform a three or five-point turn. It is also not safe to try a u-turn if you are near a curve or hill in the road. You must be able to see 200 feet in each direction to make a safe u-turn. 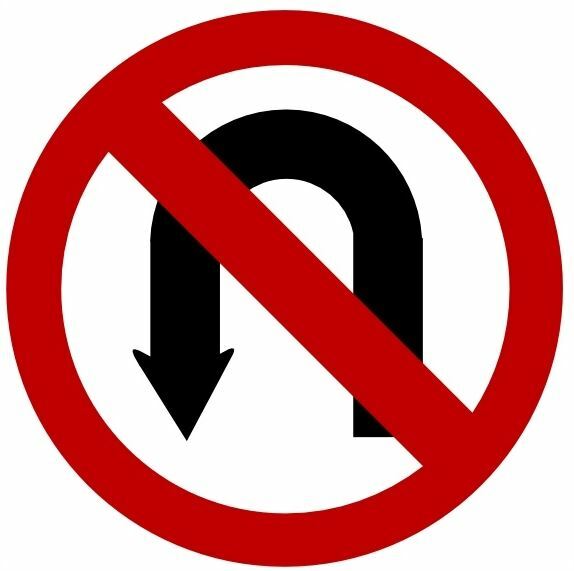 Even if it is legal and there is no sign prohibiting a u-turn, other drivers may not expect it. Oncoming traffic, most likely, is expecting you to make a left hand turn and not a u-turn. At busy intersections that are controlled by a stoplight, the left hand turn lane might be split into two lanes. Although this might be obvious to some, u-turns may only be performed from the left most lane. Executing a u-turn from the right most left hand turn lane would almost certainly cause a multi-car accident. Arguably the most dangerous place to make a u-turn is on the highway. You frequently come across “breaks” in the highway dividing the two sides. These are often times clearly marked with a sign prohibiting u-turns. These spots on the road are designated for law enforcement and for disabled cars in case of an emergency. U-turns do save time when traveling, but only when you perform them safely and legally. Make sure to stay up to date on your state laws regarding u-turns.